1A Contracting – If you're going to redo it, redo it right! When looking for the best contractor Long Island, NY has to offer, look no further than 1A Contracting. We design, build value and turn your vision into a reality. From the very start, your needs and dreams will always be our priority. Having a highly trained and knowledgeable staff, we assure you that we build with outstanding craftsmanship and materials, using experience developed during thousands of projects, across Long Island, to your complete satisfaction. We are a Long Island, NY Contractor. We specialize in Projects such as; Basement Remodeling, Bathroom Remodeling, Carpentry of all kinds, Decking, Flood Repair, Flooring/Floor Repair, Kitchen Remodeling, Painting, Roofing and Windows/Doors. Being that Long Island gets hit with many storms and hurricanes, we have been working on many Water Damage projects as well. We are not limited being a Residential Contractor. We are a Commercial Contractor too. We cover from Hewlett to Massapequa and beyond. If you’re looking for exceptional quality, you can rely on us to finish the job on time and on budget. With our reputation for delivering what we promise, you can always feel confident when you hire 1A Contracting for all of your contracting needs. Call us today at 516-280-5390 or send us an email at info@1AContracting.com to learn more and see why our clients attest to the value, quality, and confidence you can expect from us every time. Join Our Mailing List by subscribing to our mailing list on our ‘Contact Us‘ page. Please contact us if you want to know more about how we can help you. Houses on Long Island, NY are going up! Homes on Long Island’s South Shore are increasingly vulnerable to flooding as our environment changes. You will want to contact a Long Island Contractor with experience in House Lifting or House Raising. 1A Contracting is just that company. 1A Contracting is a NY Rising contractor that will get the job done for anyone wishing to raise their storm damaged home on Long Island in NY. 1A Contracting specializes in raising houses, lifting homes and getting people back to their homes & neighborhoods without being worried about another hurricane. Based in Long Beach, NY and having seen the devastation wrought by Hurricane Sandy in Oct. of 2012, 1A Contracting is dedicated to assisting local homeowners with repairs and renovations that will protect homes and families going forward. Thankfully, many more people are receiving the funds they need to raise their homes allowing them to move past a very devastating time in their lives. Contact 1AContracting.com today at 516-280-5390 to talk to a local contractor who has had experience in raising houses and dealing with all local authorities, building departments, zoning boards and also lived through Hurricane Sandy as well. Optimize Your Assets with 1Acontracting! 1Acontracting gets you better results when selling your house. Top 15 Home Updates That Pay Off! Make the place look better! Besides maximizing the return at resale, make the sale faster! Click a look here for more tips! This is taking “Staging” to the next level for the best possible results. Here at 1Acontracting.com we are happy to announce that we will be easier to find in our new office on Park Ave. in Long Beach, NY. We will be right next to the Long Beach Post Office. Stay tuned as we renovate our new space! We will be sharing the space with our good friends from Emerald Estates Realty Group! Are you in need an exterior or interior walls to be done? We install drywall, plaster walls and stucco. We also can install any type of window, from a small awning window in a basement to a great bay or bow window that stretches over an entire wall of the living room. Need new doors or windows? No problem! Exterior/interior doors are also something we specialize in. Need a new roof or a repair to an existing one? Our team of professionals can install roofs! Also, we install insulation according to the building codes of the area. The right insulation will make sure a household stays warm during cold Long Island winters. In addition, at 1A we enjoy creating the kitchen or bath of our customers’ dreams. We can sit down with you and help plan the best kitchen or bath within your budget. Keep us in mind for your house lifting project as well! One of our Long Beach, NY Projects. Click here. If you are looking for phenomenal quality work on your timeline look no further than 1A contracting. Our adept and competent staff ensure that we build with extraordinary craftsmanship and materials. 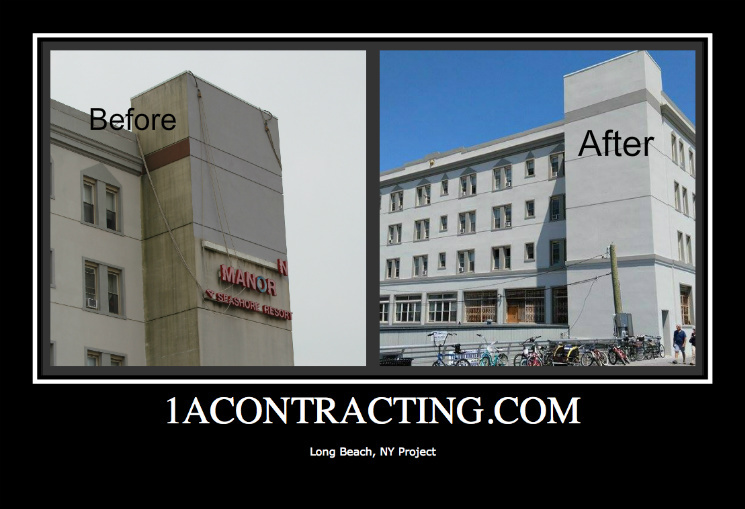 1A Contracting, Contractor Long Beach NY is your local contractor. Using our experience that we have garnered over the thousand of projects across Long Island, we can ensure that the project will be completed to your full satisfaction. Residential and Commercial Contracting is what we do all over Long Island. We’ve built retail stores, renovated old houses, built new houses, replaced roofs, repaired hurricane damages houses and even lifted a few! Our great reputation precedes us wherever we go! Long Beach to Great Neck! Our incredible reputation and our extensive services will allow you to feel confident in contacting us for all of your contracting needs. Call 1A for all your contracting needs! 1A Contracting is one of Long Island’s best contracting and home improvement businesses. We cover anything from interior to exterior, from commercial to residential. Our latest, project pictured above, looks so much better. The inside of this building will be next. We remodel kitchens, bathrooms, and basements all over Long Island. We install doors and windows. We do roofing, flooring, decking, painting, and carpentry. Additionally we repair buildings damaged by water and floods. There is no job outside of our capabilities and we offer free estimates. 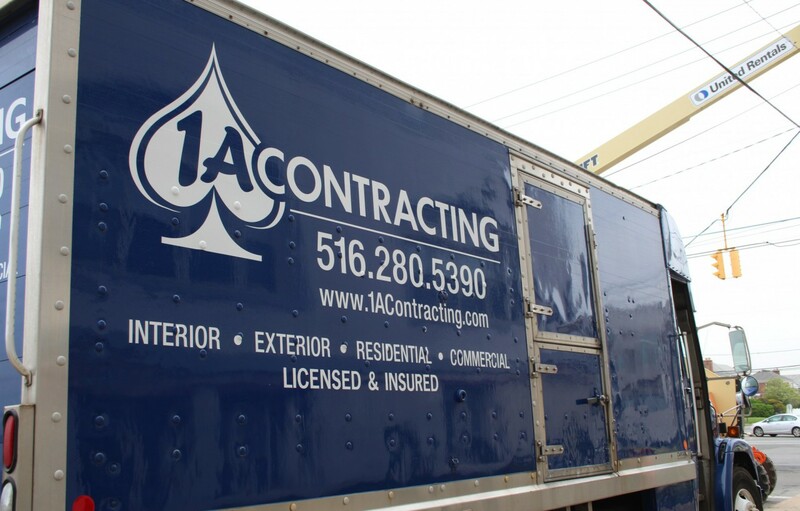 If you are searching for the best contractors Long Island has to offer look no further than 1A contracting! Whether for home or business the as the prime contractors on Long Island we specialize in all contracting endeavors. From renovating a kitchen to remodeling an entire house 1A contracting has a team of professionals can execute any exterior or interior job whether the client is residential or commercial. Here at 1A contracting we offer any and all services that have to do with home improvement. 1A is a not just any Long Island contractor. We are a full service for Long Island home improvement that can accommodate all of your needs. If you’re looking for a Long Island contractor you need look no further, our team of professionals knows the building codes of the area and always come equipped with the necessary building permits. Any customer in the Long Island area who’s looking to start a project that requires the best Long Island contractors or Long Island home improvement company should get in touch with us today! keywords: Long Island Bathroom Remodeling, Long Island Window and Door, Long Island, Long Island Floor Repair Decking, Long Island Kitchen Remodeling, Long Island Painting, Long Island Roofing, Long Island Carpentry, Long Island Flooring, Long Island Flood Repair, Long Island Water Damage, Long Island Basement Remodeling, residential, commercial, exterior contracting, interior contracting, home improvement.